Posted by Dave Emory ⋅ December 5, 2017Post a comment Email This Post Print This Post Tweet This! COMMENT: After encountering problems advancing more conventional fund-raising methods, Nazi groups are prospering due to successful mining of Bitcoin. This is not altogether surprising, in that Bitcoin’s foundations track as far to the right as can be. We have explored Bitcoin in a number of programs–FTR #’s 760, 764, 770 and 785. 2. 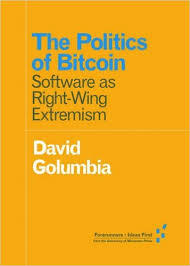 The Politics of Bitcoin: Software as Right-Wing Extremism by David Golumbia; University of Minnesota Press [SC]; pp. 73-75. “In response to client interest in digital currencies, we are exploring how best to serve them in this space,” a Goldman spokeswoman said. Unlike JPMorgan Chase CEO Jamie Dimon, who called bitcoin a “fraud,” Goldman’s technical strategist has published analyses on bitcoin’s price. The investment bank’s exploration of a digital currency trading business is still in early stages and may not amount to anything substantial. “In response to client interest in digital currencies, we are exploring how best to serve them in this space,” a Goldman spokeswoman said in a statement. Sheba Jafari, vice president on the bank’s FICC Market Strats team, was the only representative from a major Wall Street firm to issue reports on bitcoin’s price as the digital currency soared earlier this year. Top names on Wall Street are divided on whether bitcoin’s development is a good thing. JPMorgan Chase CEO Jamie Dimon directly spoke out against bitcoin last month and called the digital currency a “fraud” that “won’t end well.” Other well-respected investors such as Howard Marks have compared bitcoin to a pyramid scheme. Much of the gains come as institutional investors increase their bets on the digital currency. New “crypto-funds” are also launching. The latest tally from financial research firm Autonomous Next last week estimates about 75 such funds now exist. “The smartest Wall Street firms have an opportunity to lead the market in offering financial services to the burgeoning cryptocurrency industry,” Matthew Goetz, managing partner and CEO at cryptocurrency investment firm BlockTower Capital and a former vice president at Goldman Sachs. This article shows how a co-leader of the far right party in Germany, Alternative for Deutchland (AFD), – read it as modern National Socialist Party, is featured at a Blockchain technology conference. This article suggests that the NAZIs are ahead of the game at understanding how blockchain, the bitcoin technology can be used to their advantage, and this can have a profound effect on how economies and societies are structured. Attack of the 50 Foot Blockchain reads the title of a 2017 book. From currency speculation through to verifying the provenance of food, blockchain technologyis eking out space in a vast range of fields. REYKJAVIK, Iceland — Some 600 computers used to “mine” bitcoin and other virtual currencies have been stolen from data centers in Iceland in what police say is the biggest series of thefts ever in the North Atlantic island nation. Some 11 people were arrested, including a security guard, in what Icelandic media have dubbed the “Big Bitcoin Heist.” A judge at the Reykjanes District Court on Friday ordered two people to remain in custody. Countries with a central bank don’t “control their currency,” implying that a cabal of bankers are secretly running all the governments of the world and intentionally debases everyone’s currency to impose slave wages. And yes, the existing power of the privately owned banks over the governments of the world is an obscene danger thanks to that corrupting concentration of wealth. But privately concentrated wealth and influence, like that of Bannon’s old firm Goldman Sachs, isn’t what Bannon is talking about. He talking about the Federal Reserve and other central banks and portraying those institutions as the big boogeyman and the reason for stagnant wages. That’s the meme Bannon is promoting. The same classic ‘international (Jewish) bankers run the central banks and therefore if we just get rid of central banks that will fix everything’ meme the far right has been pushing for decades. Updated for the age of the blockchain. So just a heads up, it looks like Steve Bannon’s quest to “deconstruct the administration state” includes replacing central banks with Bitcoin, in effect making the handful of people who secretly own almost all the bitcoins the new central bankers. Which is, of course, the kind of ‘freedom’ Steve Bannon is really talking about.